Q: This morning, the US Department of the Treasury announced that the first round of China-US Comprehensive Economic Dialogue will be held on July 19. Can you confirm this and give us more details on this? A: Based on the consensus reached between President Xi Jinping and President Donald Trump while meeting in Hamburg, the first round of China-US Comprehensive Economic Dialogue will be held in Washington D.C., the United States on July 19. Chinese Vice Premier Wang Yang will co-chair the dialogue with US Secretary of the Treasury Steve Mnuchin and Secretary of Commerce Wilbur Ross. On the occasion, the two sides will have an exchange of in-depth views on economic and trade issues of common concern. Q: The Northeast Asia Cooperation Dialogue is convened in Singapore today. Joseph Yun, the US Special Representative for North Korea Policy, is attending the event. Is anybody from China attending? If so, who? A: According to my information, the diplomats from the Chinese Embassy in Singapore and Chinese scholars have attended the 27th Northeast Asia Cooperation Dialogue. Q: We have noticed that the Ministry of Foreign Affairs has just released the information that the President of the State of Palestine Mahmoud Abbas will pay a visit to China. Can you elaborate on the relevant arrangements? Hoe does China view the current China-Palestine relations? A: At the invitation of President Xi Jinping, the President of the State of Palestine Mahmoud Abbas will pay a state visit to China from July 17 to 20. This is the fourth visit of President Abbas to China. During his visit, President Xi Jinping, Premier Li Keqiang and Chairman of the NPC Standing Committee Zhang Dejiang will meet and talk with him respectively. The two sides will exchange views on bilateral relations, the Palestinian issue and other issues of common concern. China and Palestine enjoy enduring friendship. China is one of the first countries to recognize the Palestine Liberation Organization and the State of Palestine. In recent years, the two countries have witnessed frequent exchange of high-level visits, the steady development of cooperation in various fields and close people-to-people and cultural exchanges. The Chinese side stands ready to work with the Palestinian side to further deepen China-Palestine traditional friendship and promote the all-round development of China-Palestine friendly cooperation. 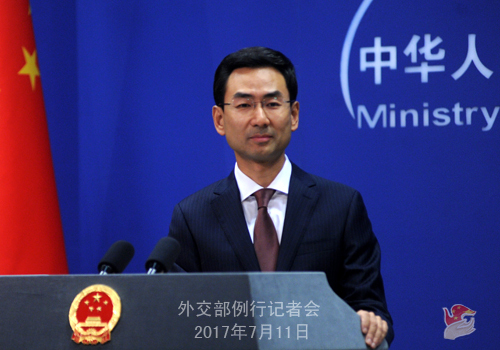 China supports the Palestinian people in pursuing the just cause of restoring their lawful national rights and is willing to play a constructive role in advancing the Israeli-Palestinian peace process. Q: Recently, the US, Japan and other countries have called on China to fully use its leverage, assume heavier responsibility, play a bigger role, take more measures and exert greater pressure on the DPRK in order to solve the Korean nuclear issue. How do you respond to that? A: As we said repeatedly, the crux of the Korean nuclear issue rests on the conflict between the DPRK and the US and it is in essence a security issue. 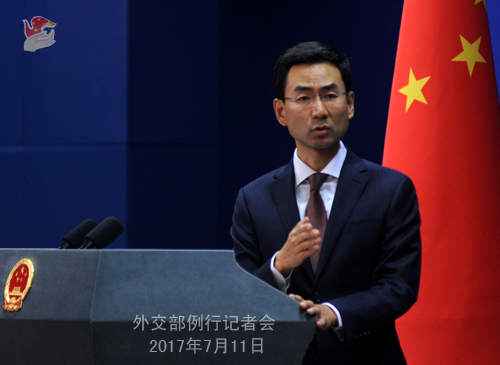 The Chinese side is neither the focal point of the conflict of the Korean nuclear issue nor the catalyzer for escalation of tensions at present, and it does not hold the key to solving the Korean Peninsula nuclear issue. In recent days, certain people have been exaggerating and playing up the so-called "China responsibility" theory. Those people have either failed to grasp the Korean Peninsula nuclear issue comprehensively and accurately, or done this out of ulterior motives with an attempt to shirk responsibility. For a long time, China has been making unremitting efforts to solve the Korean Peninsula nuclear issue and playing an important and constructive role all along. It is fair to say that China's contribution to the settlement of the Korean Peninsula nuclear issue is there for all to see and its role is indispensable. Meanwhile, to ease the situation and solve the problem, other parties should also strive for the shared goal. It won't help to absolve oneself of responsibility, or kick down the ladder, still less stab in other's back. If when China is busy putting out a fire while someone pours fuel on it, when China is faithfully following through on Security Council's resolutions while someone attempts to infringe upon China's legitimate rights and interests, and when China is working vigorously to advance the denuclearization of the Korean Peninsula while someone seeks excuse to endanger China's security interests, then how can China's efforts work out as expected? How can the situation be eased? And how can the Korean Peninsula nuclear issue be resolved? I would like to stress again that the settlement of the Korean Peninsula nuclear issue calls for the collective wisdom and coordinated efforts of various parties. We hope all relevant parties can play their due role, assume their due responsibility and join China in the efforts to bring the Korean Peninsula nuclear issue back to the right track of peaceful solution through dialogue and negotiation at an early date. Enough of the so-called "China responsibility" theory on the Korean Peninsula issue. 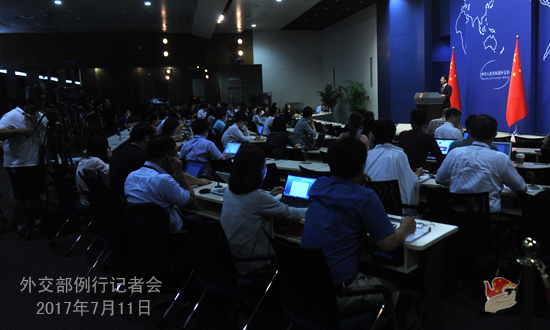 As the ninth BRICS Summit will be held in the city of Xiamen, Fujian province in early September, the official BRICS Summit Media Center Website (www.bricschn.org) was officially launched on July 10 along with the media registration system (registration.bricschn.org).